I recently moved into a new apartment, which was much larger than my old one, so I decided that it was time to invest in some new furniture. I’ve always liked the idea of a hanging chair so when a friend showed me the Exaco Gaya Hanging Basket Chair produced by Jagram Style, I just knew it would be the perfect addition to my new place. 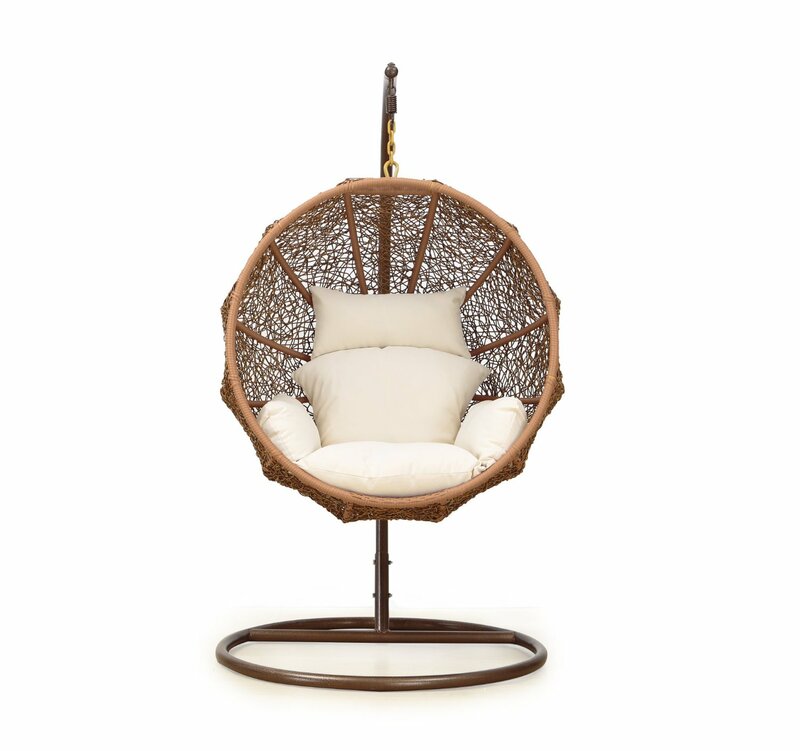 You see I wasn’t just looking for any type of swinging chair, I wanted a luxurious hanging chair that would not only offer me superior comfort but also add a designer element to my home. And I knew I had made the right decision from the moment my hanging chair arrived. My Exaco Gaya Hanging Basket Chair arrived with everything I needed to assemble it, plus a set of easy to follow instructions. There were three possible stands to take (see here) and cushion fabrics. I chose the set with Spinnaker Stand in Classic Ivory. I was impressed by the fine attention to detail that I noticed in the finishing while I was busy, and within no time I had the chair set up. 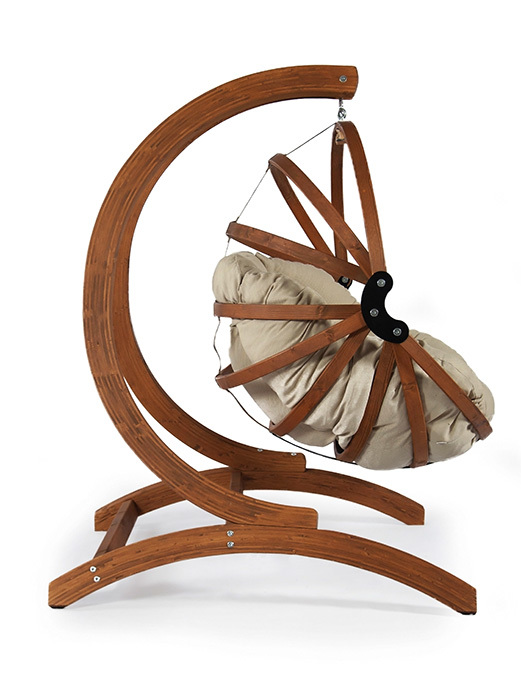 Once put together the hanging chair (complete with stand) measured 70″ H x 51. 2″ W x 50″ D.
The first thing that drew my attention to this chair was the high level of craftsmanship which is evident in the superior design. And when I sank into it for the first time I knew that I now had a piece of furniture that not only looked amazing but was snug and inviting too. Unlike other hanging chairs I have sat on in the past, the pillow that came with my chair was deep and soft. Just what’s needed for the ultimate relaxation experience. I was also impressed by the wide chair stand, which ensures the chair remains stable, even when I shift positions. It’s also more than capable of bearing my weight as the stand can comfortably hold up to 330lbs. The stand also makes the hanging chair easy to move around, and it can even be used outdoors, although it’s so attractive that I prefer to keep mine inside. 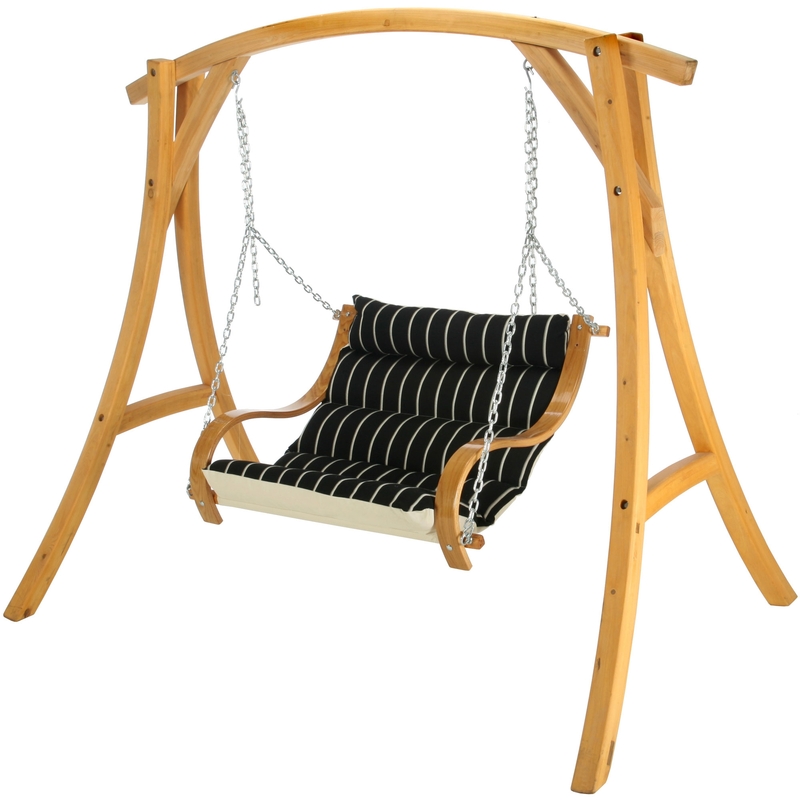 The wooden swing chair can also be removed from the stand and mounted as a permanent fixture. 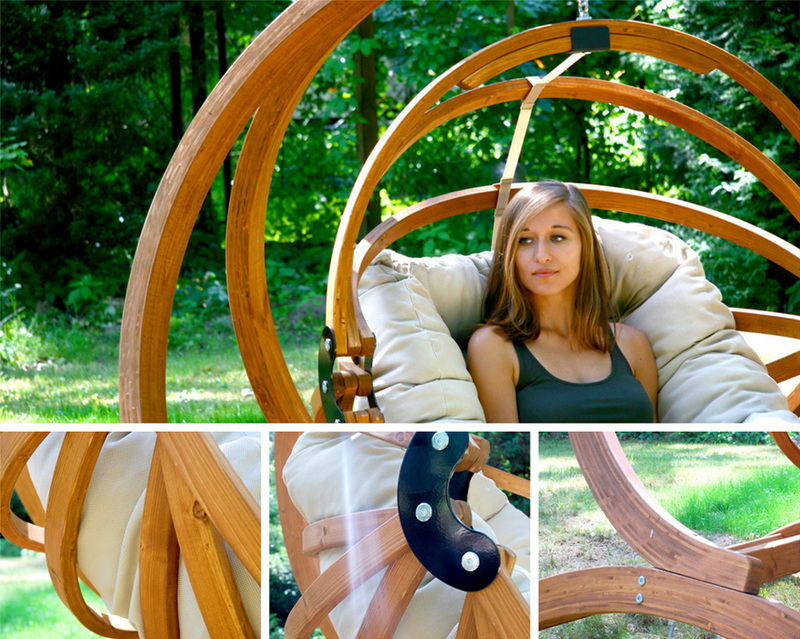 But by far the most impressive feature of this chair is its visual appeal. For me it was just what my apartment needed; a durable, cushy piece of furniture that adds interest. All my guests have commented on my new hanging chair and of course, they all want to try it out too! Exaco Trading Company brought this beautiful product line to the USA market. The manufacturer is Jagram Lifestyle from Poland. They are well known for creating modern furniture with a team of designers and engineers. Jagram uses only verified high quality and 100% FSC Scandinavian timber. The combination of excellent and natural materials and progressive and modern designs results in overwhelming, comfortable and durable leisure outdoor furniture with a unique European flair. 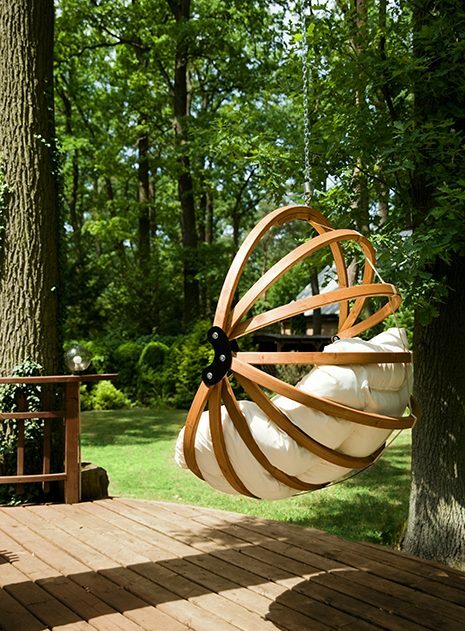 One of the unique elements that originally attracted me to this hanging chair was the high-quality wood used to create it. The manufacturers only use 100% sustainable wood sourced from Scandinavian timber forests to craft the chair and base stand. 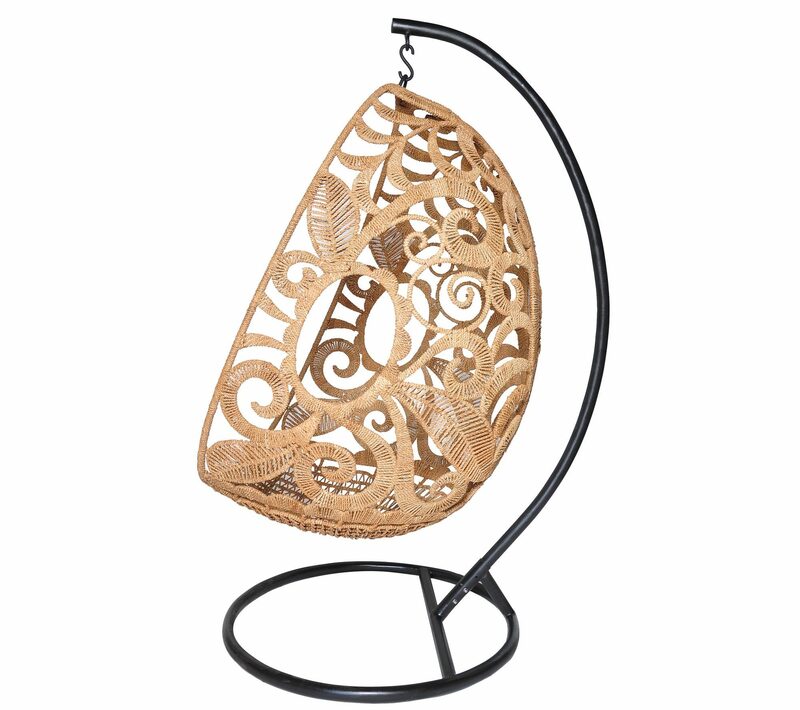 This high-quality wood immediately makes the Exaco Gaya Hanging Basket Chair far superior to most other upmarket hanging chairs. I was also really impressed by how easy the product was to assemble, compared to other self-assembly furniture items I’ve previously purchased. The only possible downside of this chair is that it does require a reasonable amount of floor space, so it wouldn’t be suitable for very small rooms. 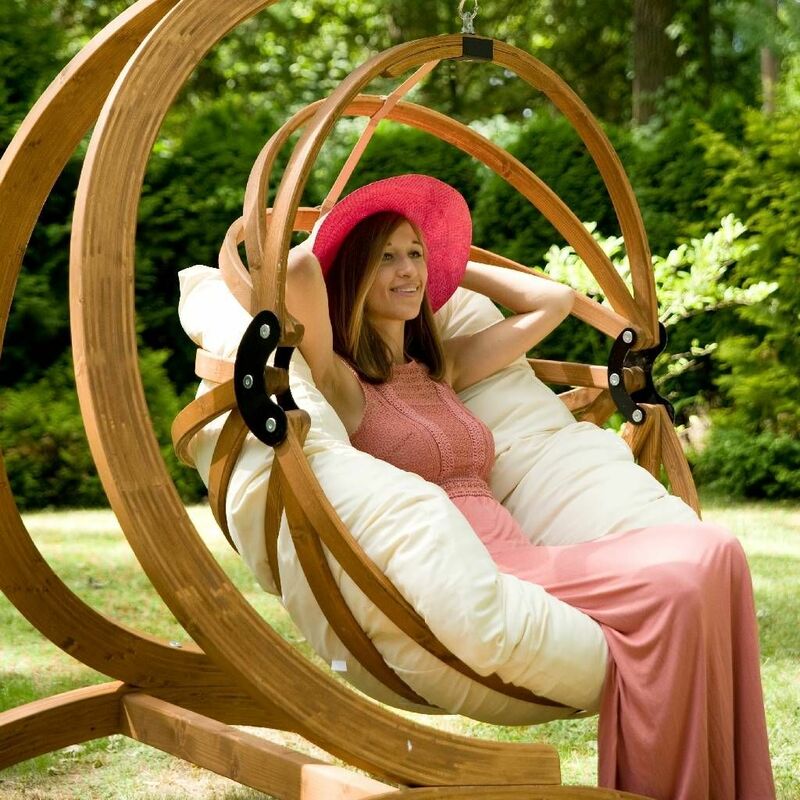 While I was considering buying my Exaco Gaya Hanging Basket Chair I did also look at alternatives like The Exaco Wave Lounger and the Byer of Maine Globo Chair. 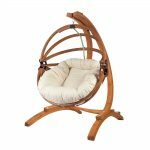 I have already recommended this chair to many of my friends and family and I would suggest anyone looking for a luxury hanging basket chair. Everyone who has seen the chair has asked me more about it, but mainly it speaks for itself through its sheer comfort and aesthetics. My Exaco Gaya Hanging Basket Chair really was the perfect addition to my new home and made the transition that much easier. It gives me the perfect spot to relax and read a book or stargaze, and I know that the superior craftsmanship means that it will last for years to come. I believe that my home is a place that I should be able to feel comfortably restful in, a retreat from the fast-paced world, where I can take it slow. Having the right surroundings, well-crafted furniture and soft fabrics makes this possible and ensures that I always have a place to unwind. I know I definitely made the right choice when buying this chair.